As you try to navigate through your divorce, you may become frustrated and you may feel like your whole world has been flipped upside down. This is so true and many of the clients that come into our New York office — mention this to us. The stress of a divorce can be a lot to handle at times, especially when you have to worry about child custody, how the property and assets will be divided, and enforcement orders. Before you panic, our divorce lawyers are here to work with you and guide you through the entire process. We have the skills needed to help you navigate through all of the divorce terms and what they mean for you. 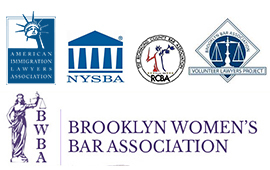 Our respected and talented New York, Brooklyn, Queens and Staten Island divorce attorneys provide a full range of family law services to those residents in New York City in all boroughs. Licensed to practice law in the entire state, as well as New Jersey, our attorneys are ready to take on ANY divorce – simple or complex. We are here to fight hard for your rights, we are on your side. We will provide you with personalized services that will focus on YOU and YOUR family needs, as well as on building a trusting relationship that you can rely on. We are experienced in all areas of divorce, alimony, property division, and child support issues. Even the most unusual problems (as they may seem to you) are not insurmountable for our New York, Brooklyn, Queens and Staten Island attorney team. In addition, we can draft prenuptial, post-nuptial, and separation agreements for you if divorce is not an option. If you are in need of assistance when it comes to your divorce or family law matters, our team is prepared to walk you through the process. Call us now for a consultation 718-769-6352. One of the things that sets Divorce Lawyer NY apart from other divorce firms is that we do not simply close the book once the divorce is finalized. In fact, we continue to provide you with the services you need post-divorce as well. Things often come up down the line after the judgment of divorce is signed and divorce granted – that is normal for every family. We can give you support services even if it has been a few months or many years since you have been divorced or from the date of the last court order. One of our most popular post-divorce services is child support modification and custody modification. Whether you think your spouse should be paying more or you have lost your job and need the amount reconsidered, Divorce Lawyer NY can help you with all modification needs even after your divorce is finalized. Our divorce lawyers are confident and persistent and have been called the best divorce lawyer team in all of New York, Brooklyn, Queens and Staten Island, NY. We are aggressive and fight hard for your rights. We do not give up. With compassion and care for you and your family, our divorce attorneys will provide you with the services you need in the best possible way. Every case is unique and we will pursue your case in the manner that is required for your situation personally. You deserve our attention and that is what you will get when you hire Divorce Lawyer NY. Just when you think you cannot handle any more of the stress, call our office – we will be your strength and guide you in protecting your family and your rights. We will take that burden off of your shoulders and even mediate between you and your spouse to ensure that no one is taken advantage of. At Divorce Lawyer NY, we work to protect your rights and will do whatever it takes to make sure you receive a good outcome in your divorce or family law matter. You can trust us to fight for your rights and preserve your assets. If you would like to speak about a divorce, separation, division of property, or child custody, call our office now to schedule your consultation 718-769-6352. Divorce Lawyer NY is focused on working with you to help you file for divorce. 2017 © Law Offices of Marina Shepelsky, P.C. All Rights Reserved.